I have received the license information. How to register TunePat Amazon Music Converter? What can I do if I get the message "Invalid Code" when trying to register TunePat Amazon Music Converter? What kinds of music does TunePat Amazon Music Converter support converting? What output formats can it export? Can I use TunePat Amazon Music Converter to convert the entire playlist from Amazon? I have received the license code. 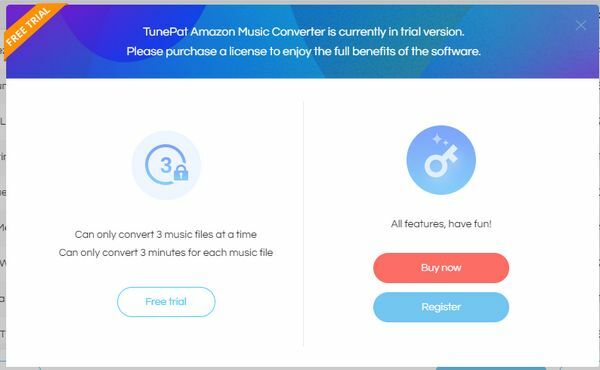 How to register TunePat Amazon Music Converter? 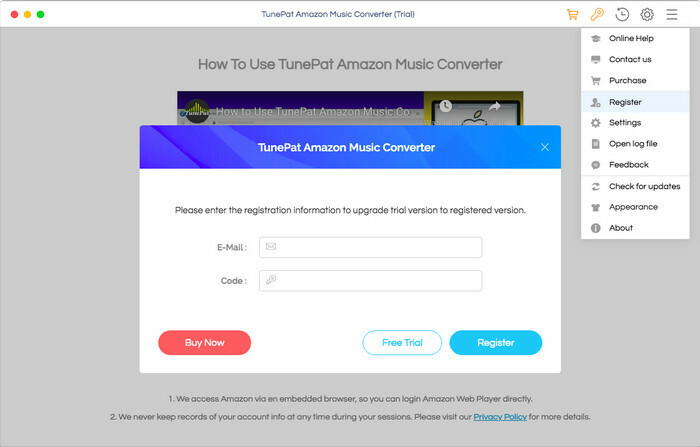 Run TunePat Amazon Music Converter on Mac and log in your Amazon Music unlimited account. Click Apple menu bar and click TunePat Amazon Music Converter > Resgister, then you will get the registration window. You can copy and paste the registration Email and Code into the registration pop up dialog. Fill the two blanks with your registration Email and license code that you have received from the email. Then click "OK" to register the program. If you still get the error message, please contact our support team via support@tunepat.com for help. What kinds of music does TunePat Amazon Music Converter support converting? What output format can it export? You can use TunePat Amazon Music Converter to download song, album or playlist from Amazon Music to MP3, AAC, WAV or FLAC format. Of course, you can use TunePat Amazon Music Converter to convert the entire playlist, artist or album from Amazon Music. Note: If above solutions still cannot fix your problems, please provide the following information to our support team via support@tunepat.com. We will reply to your message within 24 hours on weekdays and 48 hours on weekend. And we will submit your feedback to our developers and inform you if the solution is available. 1. Please send us the detailed info of your Mac OS. 2. What is the output format you choose? 3. Please send us two log files of TunePat Amazon Music Converter. 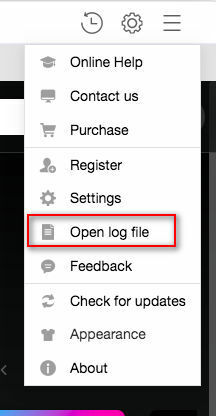 You can find them by going to the TunePat program, Menu > Open Log File. They are called TunePat Amazon Music Converter.log and widevine.log.